Following the signing of the Agreement for Peace and Reconciliation in Mali on 20 June 2015 (also known as the Algiers Agreement), AWID spoke with Bintou Founé Samaké Bouaré, president of WILDAF/Mali, and Fatoumata Maiga, founder and president of the Association des Femmes pour les Initiatives de Paix, AFIP (Association of Women for Peace Initiatives) to learn more about mainstreaming gender into the Mali peace building process and the associated challenges. Since 2012, Mali has faced serious security and political crises marked by, among others, the March 2012 military coup, attacks by armed groups and militias in the North and Jihadist occupation of the North and its progression toward the South; the French military Operation Serval between January 2013 and July 2014; and finally the establishment of a peace negotiation process between different stakeholders of the conflict, under the mediation of Algeria, which resulted in the signing of a peace agreement last month. “To end this crisis, women decided to get seriously involved in its resolution. As a result, women developed different peace building initiatives in the country. 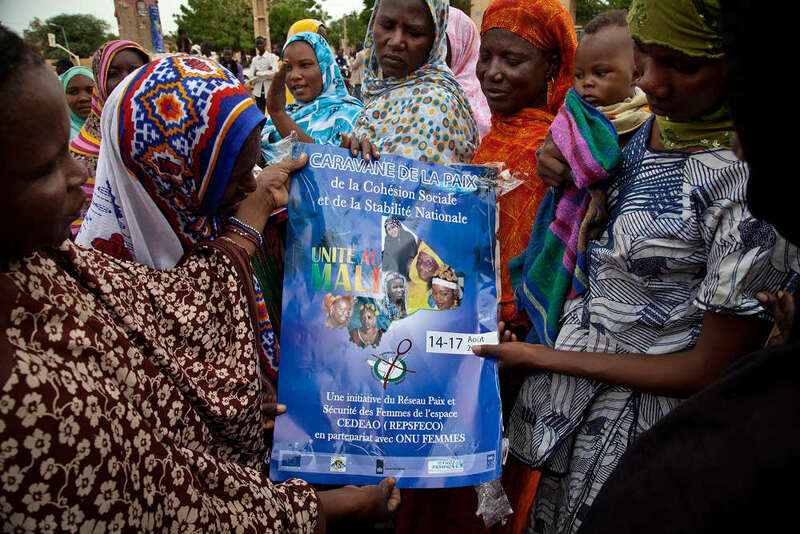 To have their voices heard, they formed a common front by establishing an informal structure they named the ‘Women’s Alliance for a United Mali’,” explains Samaké Bouaré. Resistance, mobilization and denunciations have taken place, mainly through marches in the capital Bamako, and in the Kidal, Gao and Timbuktu regions, those occupied by armed groups, and SMS messages were used to form engagement groups with young people in the Gao and Kidal regions. Support systems have also been initiated, especially for women threatened with execution by religious fundamentalist groups. In terms of peacemaking, the AFIP has committed to supporting women from Ménaka to facilitate cohesion between them, despite differing perspectives on national unity and separation of the North. In order to eradicate weapons and return confidence between communities, training was held in the Gao region on possession of weapons by communities. The Mali Women Leaders’ Platform has worked since the onset of negotiations to include Malian women’s priorities in the peace agreement, all while articulating the contents of the agreement to hundreds of Malian women. All of the initiatives toward a gender-sensitive peace building process, include advocacy from women’s movements at the national, regional and international level to “take into consideration the needs of women in the Algiers Agreement, recognizing women as victims, facilitating their access to justice, creating a compensation fund for victims, operationalizing the Truth, Justice and Reconciliation Commission, and passing a quota for women’s access to decision-making posts,” says Samaké Bouaré. Maiga adds that for women, justice and reparation need to be carried out equally effectively at the economic, social level and cultural levels and that establishing sustainable peace in Mali requires the presence of women in all related mechanisms. Despite these strategies and the energy of feminist movements for peace in Mali, Samaké Bouaré notes that, “the peace negotiation process is not gender-sensitive. Women have barely been present through the course of negotiations, which is in contravention to Resolution 1325 of the UN Security Council. The resolution, adopted in 2000, underscores the importance of equal participation of women and men in peace building and peacekeeping. Successively since 2000, six additional resolutions have been adopted by the UN Security Council to complete the framework for implementing and monitoring the Women, Peace and Security agenda. Devoid of gender issues, the content of the agreement signed by all conflict stakeholders on 20 June, following almost a year of negotiations, also only focuses on restoring order and security in the North, at a time when the population needs the State to provide social, judicial and educational services. The agreement thus constitutes a missed opportunity for establishing sustainable solutions and “repeats mistakes of the past, encouraging, for example, models of decentralisation and clientelismthat have failed to bring peace. Rather than trying to change a deeply flawed political system, it seeks only to strengthen the institutions within it. The Malian parties, who refused to engage in direct dialogue, inherit a document that is written mostly by international mediators and in part reflects the mediators’ own interests. It prioritises the restoration of order and stability rather than aiming to meet a desire for genuine change that runs deep among northern populations,” as reported by the International Crisis Group in May 2015. WILDAF/Mali is a network that promotes and protects the rights of women in Mali. Signatory organizations are FIDH – International Federation for Human Rights, AMDH – Malian Association for Human Rights, WILDAF – Women in Law and Development in Africa, DEME SO Association, AJM – Association of Malian Female Jurists and “Collectif Cri de Cœur”. Azawad is a territory in the North of Mali, which includes the three regions of Kidal, Gao and Timbuktou, the object of attempted successions since 1960 and origin of the 2012 Movement national pour la liberation de l’Azawad, MNLA (National Movement for the Liberation of Azawad) for independence. Menaka is a town in Gao region in Mali. The Commission was created in January 2014.